If you have an underutilized backyard and you don’t want to install expensive structures like outdoor kitchens and entertainment rooms, there are other options available to you. At Ivy Studio, we recommend architectural landscape structures like pergolas and arbors. Our clients find them to be very pleasant additions to their property because they’re relatively affordable and useful as well. 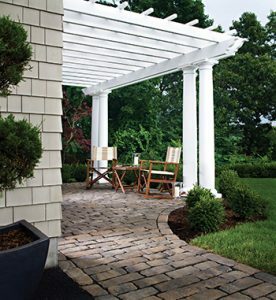 A beautiful pergola design, for example, can provide a little bit of shade or a place to hang patio lights in addition to being a beautiful structure. What Kind of Architectural Structures Can You Install? A garden pergola can be a very charming addition to your landscape because the design of this structure isn’t dominating. Pergolas are fairly minimalistic and can easily fit in with modern and traditional design concepts. They’re also very flexible and versatile.You can place them over fireplaces and pits, over decks by swimming pools and patios, and even in a lawn or garden. They don’t have a solid roof, but you can easily add a canopy to get some shade. A custom pergola would be a great addition to your property if you want something that provides a decent amount of shade. Arbors are similar to pergolas because they’re also simple and minimalistic in design. They were originally designed to be pathway canopies that provided shade on garden paths and doorways. Modern landscapers also use these to divide and add sections to the property. Arbors aren’t as functional as pergolas and won’t offer as much shade, but they are still visually appealing backyard features. They’re usually only installed for aesthetic purposes in small gardens and reading nooks. If you want something that provides more solid shelter, we can install a custom gazebo. They’re not as popular and flexible as pergolas and arbors because they don’t fit in as well with modern design preferences and concepts, but many people enjoy the shade they provide in their backyards. Arbors and pergolas look great and can add an interesting design element to your backyard. They can help create a welcoming sitting area in your backyard. We can install mechanical or retractable roofs on the pergolas to provide better weather protection. Pergolas and arbors are great for people who love to entertain and host parties. If you have any questions about our landscape architecture services, give us a call at 617-396-4003. Or, get started on your landscape design project today to have a beautiful arbor or pergola designed and installed, or take a look at our other landscape design services we offer to the greater Boston and Massachusetts Bay area.